We’d love your help. Let us know what’s wrong with this preview of Goodbye, Vitamin by Rachel Khong. Published July 11th 2017 by Henry Holt and Co.
To ask other readers questions about Goodbye, Vitamin, please sign up. Is this book okay for a twelve-year-old? I mean, does it have any bad swearing, cussing or mature stuff? Would this be a good book for a book club group to read? Going home, holidays and expectations, childhood memories. Doing our best even when it's hard and you don't 'feel' at your best, plus there are a lot of little factoids interspersed throughout the narrative that I found intriguing and new (at least to me). Also, the book is relatively short and lends well to someone who might be short on time for reading on a deadline. "Vegetable jokes," he says. "It's all I'm good for anymore." He points to the couple. "Isn't it romaine-tic?" I realise I’m in the minority, but I just didn’t find this book funny. I always feel that humour is one of the most subjective aspects of a book, and the style here didn't work for me at all. It wasn't my only issue with Goodbye, Vitamin, but it was probably the biggest one. Maybe my disconnect with the humour led into all the other problems I had. It's a book about thirty-year-old Ruth and how she deals with a break-up and her father's Alzheimers diagnosis over the course of one year. It's a quick read, rolling in at just over 200 pages, but it is messy, often disconnected and very, very random. I really struggled to connect with the narrator or her family, and this made it difficult to get through, despite the length. It's written in what seems, at first glance, like diary entries, but the narrative jumps all over the place and lacked any kind of cohesion. One minute, Ruth is dealing with her father's erratic mood swings; the next minute, she is with her best friend; and, quickly after, we have jumped back to an anecdote from her childhood. "The word testify," you said, "comes from testicles. Men used to swear by their balls." And I think this kind of tidbit is supposed to be funny. But it's not my particular brand of humour. It's like when the characters go horse-riding and the horse craps. Ha. Hilarious. Sorry, but bathroom jokes are not my thing. We also receive random observations on life, the universe and everything, which is something I usually like, but it seemed so out of place in this story. I can't stop thinking (and typing) the word "random", which I feel sums up a lot of this book. Lots of disconnected ideas, jokes and fun facts that never came together into a story I could love. I also grew tired of the snippets from Ruth's childhood where her dad recorded the exact cutesy things she said as a kid. I love books that can successfully take a serious issue - like Alzheimer's - and wrap it up in humour so that it doesn't become an emotionally-manipulative sob story but, for me, this wasn’t one of them. Eleanor Oliphant is Completely Fine is a great book I read recently that is sadness wrapped up in hilarity, and that worked much better for me. I'm between 3.5 and 4 stars, so I'll round up. It's ironic how a book told so simply could pack so much beauty and emotion into its words, but Rachel Khong's Goodbye, Vitamin did just that. This is a somewhat quirky, slightly odd book that I found quite moving—in fact, I had to do the "no, I'm not crying, I'm just rubbing my eyes" thing more than a few times on my plane ride this morning. Ruth is 30 years old. Her engagement has ended and she feels untethered to the life she has known, so she c I'm between 3.5 and 4 stars, so I'll round up. Ruth is 30 years old. Her engagement has ended and she feels untethered to the life she has known, so she comes home to visit her parents for the holidays. She has avoided her family for a while after hearing stories of her father's drinking and his infidelities, so she is unprepared to find her father, a former college professor, in the throes of dementia, while her mother is trying to care for her father, but in an oddly detached way. Ruth agrees to quit her job and move home for a year to help out, although she probably is in equal need of help, albeit a different kind. "What imperfect carriers of love we are, and what imperfect givers. That the reasons we can care for one another can have nothing to do with the person cared for. That it has only to do with who we were around that person—what we felt about that person." What follows are reflections on a difficult year for her family and herself, told as diary entries of a sort. She reconnects with old friends, gets involved in a scheme to try and help her father's self-worth, tries to understand why her relationship ended (and wonders if she really cares), and attempts to figure out her parents' relationship with each other. At the same time she takes tentative steps toward her own future. I really enjoyed this book, and despite the fact that the story is told in small snippets of events from each day, I didn't get the feeling I was missing anything from the story. It did feel a little disjointed at times—although there was an over-arching narrative, the story jumped quickly from day to day, so it didn't flow quite as neatly as it could have. Khong's storytelling, however, is utterly exquisite. While her style is rather spare, much like Weike Wang in Chemistry (see my review), she can wring humor and emotion from the simplest sentences. I can't wait to see what she writes next, because her talent really is dazzling. For those who have dealt with a loved one or friend suffering from dementia, this may be a difficult read. But Khong took what could have been a maudlin subject and added other dimensions, so it's the story of a family's journey through difficult and good times, instead of simply the story of a man growing increasingly ill. That's the mark of true talent. Wow, what a wonderful, touching, FUNNY novel, one of my favorites of the year. The structure is very clever - it's a rare novel of reverse accumulation. Ruth has gone home to take care of her father, who has Alzheimer's, and as his memory-loss accelerates, certain plots that would have been used for melodrama by a lesser writer (an affair; a slapstick sequence of classes) fade out because her dad has simply forgotten them. The writing is clever too, with an interesting, tender pivot between care Wow, what a wonderful, touching, FUNNY novel, one of my favorites of the year. The structure is very clever - it's a rare novel of reverse accumulation. Ruth has gone home to take care of her father, who has Alzheimer's, and as his memory-loss accelerates, certain plots that would have been used for melodrama by a lesser writer (an affair; a slapstick sequence of classes) fade out because her dad has simply forgotten them. The writing is clever too, with an interesting, tender pivot between caretaker and caretakee appearing about two-thirds of the way through, in the form of simple sentences that try to record a rapidly changing person as they were on a specific day. 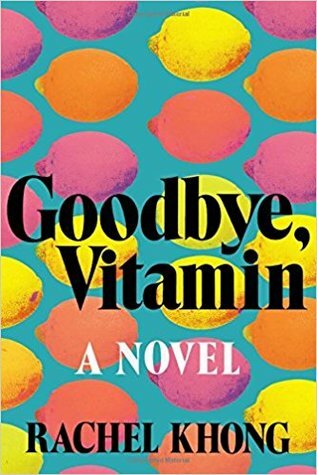 The word "quirky" is bandied about so often about mostly horrid books that it has been ruined, so I'll say instead that I deeply appreciated how weird GOODBYE, VITAMIN is. It thrums with unusual facts and lots of food descriptions, and has a great roster of unusual characters, all of whom (even a deliverer of endives!) are used at least twice. Though the novel is very short, it forms an interesting cosmos. Ruth is a fantastic lead, capable of mistakes, self-doubting, passive except when she isn't, and just a bit frustrating, as she should be. The love interest (I won't spoil it) is someone we root for as well, as is the mother. "It doesn't matter who remembers what, I guess, so long as somebody remembers something." "Goodbye, Vitamin" came highly recommended by many people whose opinion I trust and I had high hopes. I expected to enjoy it- if such a verb can be used in this context - but I didn't expect to love it so much. It was a novel that moved me deeply and made me lose my stop in the Tube on my way back from work. And this happens extremely rarely, so you understand how much it influenced me. Ruth returns home to "It doesn't matter who remembers what, I guess, so long as somebody remembers something." Ruth returns home to help her mother as her has been diagnosed with Alzheimer. He used to be an esteemed and beloved professor, but now? He's not even allowed to set foot in the campus, a rule imposed by a vindictive former colleague. So, the situation at home is very demanding. In addition, Ruth's private life has its own difficulties. Her career has stalled and her relationship has fallen apart as a result of her fiancé's infidelity. Ruth has an awful load on her shoulders and her minor and major daily trials are described in a contemporary, humorous language that is balanced and immediate, managing to communicate so many things almost without saying anything. Khong uses the diary technique to have Ruth narrate her story. At the same time, we are shown Howard's "letters" to his young daughter that are touching, sweet and a beautiful mirror to the wonderful interactions between a parent and a child. There is little dialogue and many poetic, almost dreamy, passages about Ruth's life before and after this eventful year. Her thoughts and confessions, her effort to reminisce about the past in order to understand the present is our vehicle to the story, but I didn't find this alienating. On the contrary, entering her mind made me understand and appreciate Ruth and her surroundings even better. This girl is a delightful character. I loved her and connected with her from the start. She is a tricky one, though. She is brave and resourceful and refuses to give up, but she has many moments of weakness and sometimes, she is too severe with herself. At the hands of a less capable writer, Ruth would have become unlikable, drowned in puddles of melodramatic self -pity. However, Khong knows her Art and, in my opinion, she succeeded in creating a highly memorable heroine that is real, approachable and very interesting. Khong manages to compose fully-developed characters within a limited number of pages. I felt that there was an aura of mystery surrounding Howard, as a father and a husband, as a professor. Linus and Theo were very sympathetic, as well. I can't say the same for Ruth's mother, but she had her reasons. This book is like a beautiful breeze. Khong chose to deal with a very difficult subject as Alzheimer is one of the central issues that are addressed in our society. Judging from myself and from discussions with young and elderly people, this disease constitutes one of our major fears. How would it feel if our parents weren't able to recognize us? How would it be if we were unable to recognize our children? It is too frightening....Books such as this one provide a more optimistic perspective and Khong uses humour mixed with sadness to create a bittersweet novel that never becomes disrespectful or light. It's the kind of book that should be read in order to be felt and one more bright example to the endless list of Contemporary Fiction diamonds. There are moments of beauty, moments of laughter, many moments of sadness faced with the knowledge of what is to come, and recognition of what is now the past. When Ruth comes home to help take care of her father who is in the early stages of Alzheimer’s, it is partly an escape from the mess her own life has become, and a return to the comfort of home. A bittersweet return to her childhood home. We age together, our parents and ourselves; the process is so gradual that we rarely think about this. We realize, of course, that we are growing older, we may marry, or have children to remind us how quickly the days pass, but we don’t see our parents the same way. We look at old pictures of them and may vaguely recall that they used to look that way, but we don’t really see that. We see them as we’ve always seen them. Our caretakers. The people who raised us, and when the tables are turned, it’s a hard thing to recognize in someone you’ve known your whole life. That Christmas, her father had given her a small, worn, red notebook, a notebook he’s kept notes in since she was very young. These moments, these excerpts from this notebook are scattered throughout ”Goodbye, Vitamin” but there is much that sweetens the bitter truth of her father being robbed of his memories at the same time as she realizes how closely their memories are intertwined. She reads everything she can on Alzheimer’s, what foods to eat and not to eat, what testing is being done on the subject, and in doing so she learns that scientists are now embedding false memories in mice. ”Why don’t they figure out how to keep mice from forgetting things? We don’t need more memories. It’s hard enough trying to get a handle on the ones we’ve got.”. The notes her father wrote are ones that will pull at your heartstrings, remind you, perhaps of your parents, or how you view the little things your own children say and do, or did, or maybe memories of stories you heard your parents tell you about yourself… lovely memories, cherished ones. This is a deliciously sweet story, with hints of sadness within, but it is never overwhelming, a reflection on love conquering even those moments of sadness and reminding us of how sweet memories can be. Many thanks for the ARC provided by Henry Holt & Co.
Goodbye, Vitamin. Goodbye! I yell louder and wave more frantically, in case it isn’t clear: Goodbye! No, I won’t see you later. Go find another reader, one who will appreciate you! Yep, I had to head to the shed and drag out the old Complaint Board. It’s been collecting cobwebs, which is a good thing because it means that recently I’ve been reading a lot of books I love. I’m in the minority here. Most people liked this book about a daughter, Ruth, returning home to care for her demented dad. It Goodbye, Vitamin. Goodbye! I yell louder and wave more frantically, in case it isn’t clear: Goodbye! No, I won’t see you later. Go find another reader, one who will appreciate you! I’m in the minority here. Most people liked this book about a daughter, Ruth, returning home to care for her demented dad. It is well-written and pretty innocuous. The book just didn’t work for me. Both the voice and the content bugged me—no, “bugged” is too mild a word. The book grated on my nerves. When that happens, there is little hope of a love affair. I say toe-may-doe, you say toe-maud-o. When you come right down to it, it’s mostly a matter of style. Some people tuned right in to this book. They liked the writing style, which I found self-conscious and too precious. I just didn’t like the way the story was told. Nope, we would never be friends. I felt zero connection with the narrator. I mean zilch. I think it’s because she didn’t talk about her feelings much, if at all. Nor was there any introspection. Kids say the damnedest things! . . . . But so? Yes, I’m being anti-Hallmarky here. Throughout the book, there are journal entries from Ruth’s dad, documenting all the adorable things Ruth said as a kid. Ah, yes, isn’t that clever and cute. But it adds nothing to the story. Okay, so I remember writing down all the cute things my kids said, and it’s a kick to reread them. However, I will not just stick them randomly into a novel. I don’t want to hear weird, random facts in the middle of a story. It’s like the author went to a book called “Weird, Random Facts,” grabbed a bunch, and plopped them into the story here and there. What? If the author had thrown the facts into a non-fiction essay, that would have been fine, but I didn’t appreciate them here. They seemed unrelated and out of place, and they detracted from the story. Giving the author the benefit of the doubt, perhaps she wanted to juxtapose some facts against the sad reality—like maybe it was a way that Ruth coped with the sadness of her dad’s condition—but I just wasn't feeling it. Nope, don’t want to hear descriptions of dreams, either. It doesn’t happen often, but it still annoyed me. Hold your horses! (While I take a car ride in my pajamas.) Okay, these two things (horsebacking riding, and later, a car ride in PJs) are not related in any way but both really drove me nuts. Super super minor, and neither activity hardly took up any space—but they go on my Complaint Board anyway. Okay, horses first. Ruth and her buds arranged for her dad to teach a fake college course, because he no longer was allowed to teach a real class. This was very sweet. (Seriously, I did think it was sweet.) Someone got the bright idea to hold one of the classes on horseback because the subject of that particular class was the Pony Express. In the very next paragraph, there goes dad and the crew riding horses. Wait a minute. Come on, how many people do you know who have instant access to a bunch of horses? And if they did have access, there should have been at least one or two transitional paragraphs to get them to the horses—if they happen to live anywhere near a horseback riding facility in the first place. I don’t know about you, but there’s not one in my ‘burb that I know of. And I don’t know one adult (who isn’t totally into horses) who ever just goes horseback riding, all la-dee-da. “But wouldn’t it be educational to have class on horseback? we suggest to Dad. He agrees happily." Relevance? Was this really an image we needed? And surely this added nothing to the story—we don’t need to know about a horse pooping, sorry. I’m assuming the writer is trying to be funny. I just wasn’t laughing. Bathroom jokes aren’t my favorite thing anyway. They travel all over the place. Maybe it’s common for people to go on trips in their pajamas? So yes, I could be getting a little too nit-picky here. It just seemed like she should have had Bonnie go in and change into clothes first—the editor in me would have been a lot happier. “Tonight a man found Dad’s pants in a tree that was lit with still-hanging Christmas lights." Unfortunately, the seduction ended there. For me this book was a hard vitamin to swallow. 3.5 Stars.. "Just the year is all it will be." GOODBYE, VITAMIN is a light read about a heavy subject matter......Alzheimer's. It is about a husband/father with declining "lapses in memory....a forgotten betrayal....a special love for daughter Ruth....and the various ways family members keep him eating, involved, happy and active....some are so very touching. It is about....and a bit heavy.... on daughter Ruth's personal life, her past and most recent relationship...the breakup... and her reconnection with an old girlfriend. You'll also find here quite a few healthy eating tips and fun bits of trivia, BUT...honestly, what I wanted and expected was more time with dad in the storyline....like the memories with mom....like the childhood conversations with Ruth from the little red notebook....they were wonderful, but ended all too soon. Very decent fictional debut; but (for me) the story lost focus with too much time spent away from dad. Perhaps that was the point....to show that caregivers have lives too....I'm not sure. Many thanks to NetGalley and Henry Holt & Company for the ARC in exchange for an honest review. Goodbye, Vitamin by Rachel Khong is a 2017 Henry Holt publication. I wasn’t sure if I had the emotional wherewithal right now to read a novel that most assuredly would lean toward the depressing side. But, on occasion, I simply can't resist a publishing push and with less than two hundred pages I figured I could handle whatever emotional punches were thrown my way. Once I started reading the book, however, I found the tone to be lighter than I had anticipated, and soon fo Goodbye, Vitamin by Rachel Khong is a 2017 Henry Holt publication. Ruth’s mother invited her to move back home after her father begins exhibiting signs of dementia. Having just broken up with her fiancé, feeling at loose ends, Ruth accepts the invitation and moves back home for a year. Ruth’s narration is often flighty, meandering, disjointed, and disorganized, as she works through her personal heartbreak, her mother’s disappointments, and of course her father’s battle to keep his mind sharp and stay active as long as possible. While Ruth is really hurting, she is also determined, treading into uncharted territory, discovering her parents weren’t perfect, but learning to see them in a new, more mature light, as she must now be the adult in the home. She reconnects with old friends, her brother, Linus, and comes to realize despite his foibles, she is the light of her father’s life, the apple of his eye. The discovery of her father’s diary which detailed conversations he had with Ruth when she was a child, was charming, often hilarious and sweet, but also a little sad. These entries were my favorite part this book and I loved the way Ruth borrowed from this idea, which showed how life really does seem to come full circle. Life and family are messy, but through all the turmoil, mistakes, and heartbreak, I think Ruth discovered a way to give back to her father some of what he gave to her, and in the process, managed to find the beginnings of her own inner peace. Ultimately, despite the quirky writing style, or maybe because of it, I ended up enjoying this book far more than I would have thought. While this may have been a short, quick read, it was a touching story, overall, and I’m glad I decided to give it a chance. Goodbye, Vitamin by Rachel Khong is a touching gem of a novel about family, friendship, and Alzheimer’s disease with an added touch of laughter, sadness, and love. Ruth Young's life is falling apart, her fiancé just left her for another woman, and her career is going absolutely nowhere. Heartbroken and lost in life, Ruth decides to return home and spend Christmas with her parents. Once home, Ruth's mother begs her to stay for one year to help out with her father who has Alzheimer's, despite her Goodbye, Vitamin by Rachel Khong is a touching gem of a novel about family, friendship, and Alzheimer’s disease with an added touch of laughter, sadness, and love. Ruth Young's life is falling apart, her fiancé just left her for another woman, and her career is going absolutely nowhere. Heartbroken and lost in life, Ruth decides to return home and spend Christmas with her parents. Once home, Ruth's mother begs her to stay for one year to help out with her father who has Alzheimer's, despite her father's insistence that he is absolutely fine. As her father's memory deteriorates Ruth and her mother search for added health benefits - jellyfish recipes and supplements, vitamins, and cruciferous vegetables, all of which her father dislikes. Ruth is determined to read everything she can on Alzheimer's, including all the testing that is being done by scientists to this day. Goodbye, Vitamin is told in a compelling diary form that chronicles the course of a year. Ruth's story is raw, intimate, funny, and tells a story about love, patience, and forgiveness. It's hard to believe that this is Rachel Khong's debut fictional novel. She hit it out of the park with her brilliant storytelling in this heartfelt and entertaining novel. I’m dealing with two aging parents, one of whom has some memory issues. So, this book interested me. Ruth is much younger than me, just 30. Her father is young enough to still be working when Alzheimer’s rears its ugly head. Her fiancé has just left her and she’s feeling rudderless, so she quits her job and moves home to help her mother take care of him. Her younger brother offers no help. This is billed as a comedy. But at the beginning, it seemed more hopeless than comedic. It made me feel sad I’m dealing with two aging parents, one of whom has some memory issues. So, this book interested me. Ruth is much younger than me, just 30. Her father is young enough to still be working when Alzheimer’s rears its ugly head. Her fiancé has just left her and she’s feeling rudderless, so she quits her job and moves home to help her mother take care of him. Her younger brother offers no help. This is billed as a comedy. But at the beginning, it seemed more hopeless than comedic. It made me feel sad and depressed. There are touches of sweetness, and as the book went on, I found flashes of humor. After a breakup with her fiancé, whom she quit college, to follow him to California, Ruth returns to her hometown to help her mom care for her dad who has Alzheimer's. This is an introspective time for her, and also a humorous yet heartbreaking time as she cares for him and deals with her own issues. I really liked the journal entries that her father kept about her through her growing up years which he shares with her throughout the book. Thank you to Henry Holt and Company Publishing and Netgall After a breakup with her fiancé, whom she quit college, to follow him to California, Ruth returns to her hometown to help her mom care for her dad who has Alzheimer's. I'd seen mixed reviews of this one so I held off on it for a while. But I knew it was a quick read so I finally picked it up. I personally loved the sparse contents, a journal with brief entries of a sort, chronological over the course of a year. Ruth, the novel's narrator, returns to her parents' home to help with her father, who has Alzheimer's. Her own relationship has failed and she quits her job to return home, after several consecutive years (or at least holidays) away, so she hasn't seen I'd seen mixed reviews of this one so I held off on it for a while. But I knew it was a quick read so I finally picked it up. I personally loved the sparse contents, a journal with brief entries of a sort, chronological over the course of a year. Ruth, the novel's narrator, returns to her parents' home to help with her father, who has Alzheimer's. Her own relationship has failed and she quits her job to return home, after several consecutive years (or at least holidays) away, so she hasn't seen the deterioration as it happened. The word that came to mind as I sipped a holiday coffee is "bittersweet." The nostalgia and memories are difficult because of the present reality, but the new experiences and transposed realities also have a level of enhanced importance to them, now that the impermanence of life has been acknowledged. "What imperfect carriers of love we are, and what imperfect givers. That the reasons we can care for one another can have nothing to do with the person cared for. That it has only to do with who we were around that person - what we felt about that person." There are tiny pieces of the novel that are pieces of journals of her father, observations he made about her when she was a child and would say something accidentally clever or funny. The novel shifts to include more of these from her perspective about her father, and more and more to the present moment without the history. This may seem confusing or small but I think anyone who has been even a partial companion to a parent dealing with a permanent or terminal illness will recognize this type of world. It becomes so small, so fast, and unless you focus on these tiny moments of observation and amusement, all it is is the disease and the loss. So for me, this book is not the least bit shallow, but the natural companion to a very hard time. I also just loved the tiny asides and comments... it reminded me of the tone of a lot of my emails, actually. Maybe I just found myself a lot in this book. "Lately my thing is inventing new yoga poses. The Onion is one. You make yourself very round, then peel yourself, limb by limb." "Tonight I try my hand at dessert: baked Alaska, because of course. It's so epic! How can you bake Alaska? How can you not?" "He tells me about his day. How he was, when I called, leaving a bad stand-up show and feeling outrage. How, earlier today, he returned bad avocados to the grocery store, and got a refund, and felt triumphant." Although this be a slim little book, it is chock full of feeling. Familial love. Romantic love. Selfish love. Imperfect love. This book chronicles a year in Ruth's life when she abandons her independent life away from home, to help her mother car "What imperfect carriers of love we are, and what imperfect givers. That the reasons we can care for one another can have nothing to do with the person cared for. That it has only to do with who we were around that person—what we felt about that person." This book struck all the right notes for me: sweet without being saccharine, funny but not trying too hard, characters that are charmingly offbeat without being capital Q "Quirky". There's a sort of wispy melancholy that never becomes too maudlin. Today, when I told you to behave, you roared angrily: I'M BEING HAVE. Today I had to stop by the post office, and you looked around and said, aghast, This book struck all the right notes for me: sweet without being saccharine, funny but not trying too hard, characters that are charmingly offbeat without being capital Q "Quirky". There's a sort of wispy melancholy that never becomes too maudlin. Today I had to stop by the post office, and you looked around and said, aghast, "This is errands?" Today you were so readily impressed by me. There are many of these throughout the book, which are later mirrored by the adult daughter's similar observations about her elderly father. I loved this book. I want to curl up with Rachel Khong's writing and take a nap with it. It's so lovely and thoughtful and comforting. What a sweet, sad, yet funny book. Told in journal entry format, the novel follows one year in the life of Ruth, who, reeling from a break-up, goes home to help her mother take care of her father who is suffering from Alzheimer’s. She has avoided her family for years, as her father was a drinker and cheated on her mom. Throughout the novel are snippets of journal entries of her father’s from when Ruth was a child. The wonder of the world through a child’s eyes is seen, as many of the entries are the cute, funny, and endearing things children say. The love her father has for her shines through. It helps Ruth, and the reader, see her dad with new eyes. The themes of family, love, forgiveness, friendship, and of course, memory, are explored. Most of Ruth's journal entries are small snippets of her day, in conversational narrative. A fun aspect of the novel is how Ruth researches AD and attempts to slow down the progression of her father’s Alzheimer’s through vitamins, oddball recipes (jellyfish), and superfoods. Food plays an important role in the novel. The comic relief is what keeps this novel from being maudlin. Ruth’s wry observations and her imperfect family can be quite funny. The truths the book contains are never heavy-handed or manipulative. I love it when an author trusts the reader to “get it”. I really liked Ruth’s voice and when I turned the last page, I wasn’t ready to say good-bye. A fantastic debut! This is a sweet story that reminded me of the film "Other People." It somehow straddles being light and quick with such a heavy subject matter: Alzheimer's. Hard to call it a summer poolside read because it is a bit sad, but I can imagine taking this one on a vacation if you're in the mood for something to get lost in or dip in and out of, but still finish in a timely manner. I picked up Goodbye, Vitamin because I had read a review which called it a 'comic novel about Alzheimer's'. I am very much of the belief that anything can be made funny, even Alzheimer's, so this novel sounded right up my alley. I quickly discovered however that this isn't a comic novel about Alzheimer's, it's a comic novel featuring Alzheimer's. But this didn't put me off, Rachel Khong's hilarious worldview kept me going throughout this short novel. The plot revolves around Ruth, a woman who h I picked up Goodbye, Vitamin because I had read a review which called it a 'comic novel about Alzheimer's'. I am very much of the belief that anything can be made funny, even Alzheimer's, so this novel sounded right up my alley. I quickly discovered however that this isn't a comic novel about Alzheimer's, it's a comic novel featuring Alzheimer's. But this didn't put me off, Rachel Khong's hilarious worldview kept me going throughout this short novel. The plot revolves around Ruth, a woman who has reached her mid-life crisis at age thirty, who decides to pause her life for one year to act as carer for her father who has Alzeimher's. The novel takes the form of her day-by-day diary. The weakest aspect of this novel is by far the plot. The novel trundles along with a story that is somewhat unbelievable and, whilst the character list is relatively economic, there are no standout stars of this novel. Thank you to Goodreads First Reads program for this book, which I won as a giveaway and might not have read otherwise (and thanks, Cheri, for the recommendation of this book that hits shelves on July 11). I will be honest: I don’t know how to feel about this novel. Prior to picking up this book, I had just finished reading a heavily literary, epic novel that was almost 600 pages, and perhaps the contrast felt a bit like culture shock. This book is only 194 pages (and I think you could shave off another 50 due to the journal-entry formatting and short, short paragraphs). And while this novel, about a young woman’s return home to spend time with her father who has Alzheimer’s, is physically small and quite sparse on words, it does pack an emotional punch. It does so, however, amid a great deal of humor. (Hence my own confused state of mind). Alzheimer’s. Sad. Hilarious, seemingly unrelated observation. Funny. Repeat. I have to think that the author, Rachel Khong, possesses this dry sense of humor, as well – and, as a result, I think it would be a blast to hang out with her. I truly did laugh aloud too many times to count (often worried I’d wake my sleeping husband). So there is a bit of magic in this author’s ability to tell a deeply affecting story with interspersed humor. And perhaps that IS the point: that to deal with painful situations, humans do what they can to cope—often resorting to humor to make sense of the senseless. Ruth has her own life issues to deal with, and to cope, her outlook on the world is infused with bits of humor. This book also is painfully close to home. My father was recently diagnosed with vascular dementia, and I am planning a trip home to be with him – not altogether different than Ruth’s trek home – as the mental decline is happening rapidly (to be honest, he’s been fighting this for more than a decade). I naturally feel dread and overwhelming sadness, coupled with the sense of this trip having some kind of ‘finality’ to it. So it is no surprise that one night, after reading VITAMIN at bedtime, I awoke in the middle of the night feeling sheer panic, the reality setting in that Ruth’s life and her experiences are soon to be mine. The inevitability of the situation really sunk in. Witty, comical, downright hilarious at times... once I started this I was so afraid that reading about Alzheimer’s would trigger sad memories from when my grandma had it but this story was funny. Ruth goes to live with her parents after a breakup from her fiancé just when her dad is at the beginning stages of memory loss. Through most of the story it’s her dad giving her snippets of memories he had of her as a girl and at the same time Ruth is making her own memories with her dad before the dise Witty, comical, downright hilarious at times... once I started this I was so afraid that reading about Alzheimer’s would trigger sad memories from when my grandma had it but this story was funny. Ruth goes to live with her parents after a breakup from her fiancé just when her dad is at the beginning stages of memory loss. Through most of the story it’s her dad giving her snippets of memories he had of her as a girl and at the same time Ruth is making her own memories with her dad before the disease consumes him. I'm trying to put my feelings into words about this lovely first novel by Rachel Khong and what I feel is I want to hug this book and everyone in it and tell them it will be ok, they are good, and they are loved. This is a slender little novel, barely 200 pages long. And it often feels like a short story stretched out on a rack, which may not sound complimentary but it's meant to be; there’s a perfectly full but fleeting sense to things. It's written as diary entries in a year of the life of Ruth I'm trying to put my feelings into words about this lovely first novel by Rachel Khong and what I feel is I want to hug this book and everyone in it and tell them it will be ok, they are good, and they are loved. This is a slender little novel, barely 200 pages long. And it often feels like a short story stretched out on a rack, which may not sound complimentary but it's meant to be; there’s a perfectly full but fleeting sense to things. It's written as diary entries in a year of the life of Ruth, a 30 year-old Californian who is adjusting to the sudden end of a relationship she thought was THE ONE, a career she fell into rather than chose, and her father's illness. Once a university history professor, he is forced into unwilling retirement with the onset of Alzheimer's. When Ruth learns that her father's pants were found draped amongst the Christmas lights in a strangers' tree, she moves home to Los Angeles to help her mother take care of him. She decides she will stay for a year, then hopefully figure out what in the hell she'll do after that. What follows is a years' worth of sometimes hilarious, sometimes wistful observations, often addressed to her father as he once did in a journal he wrote for her as a child. We follow Ruth as she fumbles around doing the best she can, navigating her new relationship with both her parents, unspoken and long-simmering family tensions, and the most tenuous of flirtations with her father's former teaching assistant. This book almost made me cry when it ended, because I loved everyone in it so much. The last book that made me feel this way was Less, a book I had to eventually go back to and add to my Favorites shelf. This one may eventually find her way there as well. I know now that if Rachel Khong has written it, then I'm in. SO in. It makes me so happy to connect with a writer this way. In last night's dream, I was in high school geometry class. There was a class pet: a canary who chirped with the correct answers. He'd been trained in square roots. A classmate, wanting to stump the canary, asked what was the square root of 28,561? The bird chirped confidently to 169. In the morning, I was impressed, not with the canary, but with my subconscious mind, for knowing the math. "Why couldn't you visit, Ruth?" she asks quietly. "Why couldn't you manage to visit?" This, I don't know how to answer. Truthfully? I didn't want to see you suffering. I didn't want my fears confirmed. It was less terrifying this way: not helping you, not saving you, just leaving you all alone. And then quietly, she adds, "This wasn't how I thought it would be." "Having a daughter," she says. Today at the store you stole a chicken, by mistake. What happened was we lost each other at the store, and after I had paid for our things, I found you outside, clutching this chicken like it belonged to you--like it was your motorcycle helmet. I knew immediately it was theft: you hadn't brought your wallet with you. "What do we do?" I said, panicked, and you shushed me, and we walked, briskly, to the car. "We should bring it back," I said at home later. Don't be ridiculous, you said, and we put it into our Ronco rotisserie. When Ruth comes home to help care for her father, afflicted with Alzheimer’s a beautiful family story unfolds. By no means are they are perfect family, but my heart capsized when reading the notes her father wrote about her questioning mind when she was a child.“You scraped seeds off of bagels and planted them in the flower bed out front. I didn’t have the heart to tell you that there’s no such thing as a bagel tree. Today I thought: I’m nuts- I’m just nuts- about you.” I was nuts about her, such a curious, spirited little girl! All children should know such love and attention. Ruth has always adored her father, but she has been blind to his failings in ways her brother and mother haven’t. For them, the later years weren’t full of a happy husband and father. Maybe her memories are distorted by her enduring adoration of her dad. There has been drinking and cruelties she escaped, and in coming home, with her father’s memories slipping, in his confused state she realizes he wasn’t the most loyal husband nor sober father. College students rally together to make sure he is able to feel important again, teaching is vital to his happiness- and this is one of the sweetest fictions an author has conjured. The novel manages to expose the rawness of family love. It’s a slow understanding that is revealed about Ruth’s mother and father’s complicated marriage as she spends time with him and his slipping memories. Who is the young woman that seems more intimate than she should when in his presence? Why is her mother so angry and yet, she cares for him so tenderly that she expels anything that risks his health. Not that her father much appreciates his wife’s nurturing. She wants to understand why her brother Theo is so mad at their father, but maybe she needs to face her own shame in not coming home sooner. It’s a hard novel to review for me because it’s not a flashy story. Nothing big happens but it is something enormous isn’t it? The betrayal of one’s own mind slowly leaving you, what is more horrible? Unlike many fictional stories, with this one- there are ups and downs. It’s a decline but a slow one, and often that is how illness has it’s grasp on a family- particularly with Alzheimer’s disease. Memories can be mean and bite, but they can be beautiful and moving. There is not one perfect character, but that’s what makes it honest. Something about this family tugged at my heart, and I fell for them. I was fattened up by a father’s love for his little girl, and the bittersweet pain of seeing your parents as human beings rather than gods. Lovely. Add this title to your summer list. This morning’s [hangover] is a rodent: pesky but manageable. It was grotesque, the way I kept trying to save that relationship. Like trying to tuck an elephant into pants. The moon, tonight, looks like a cut zucchini coin. I’ve always been a fan of a certain kind of summer read—the book you take to the beach, expecting only fun and laughter, when it blindsides you with emotion and devastating insights until you’re both laughing and crying, tears and sand on your cheeks combining into an abrasive paste that would feel painful if you weren’t completely immersed in an incredible book. (Just me?) The kind of book that matches lightness with a certain level of darkness, feeling all the more true and alive because it contains everything alongside everything else, the way our lives do. This summer, that book is Goodbye, Vitamin, the debut novel from former Lucky Peach editor Rachel Khong. Told in diary format, the novel follows a young woman named Ruth, whose life is in somewhat of a shambles after a broken engagement. She moves back home to help her mother care for her father, a history professor who has just been diagnosed with Alzheimer’s. Along with Ruth, every one of the characters feels alive. Her mother, her father, her brother, her friends, her father’s former grad students—they are wonderful, strange, and infuriating (sometimes all at once) in the way of people you love or could love. And that’s how Goodbye, Vitamin gets you: As it dazzles and delights, as it compels you to fall in love with the people within its pages, it too shows you what is impossibly hard about love, about life. The book explores questions like: What do we owe each other? How do we forgive people when they change, especially when we haven’t fully forgiven them for who they were before? How are we supposed to let go at the same time we’re desperately trying to hold on to what we can? Full of food, family, friendship, and love, Goodbye, Vitamin contains everything a reader might need to make them happy, while also showing how these things can be taken away, whether by accident or time. It is heartbreaking. It is a joy. Which means, of course, Goodbye, Vitamin is a perfect summer book. 30 year old Ruth finds herself sitting alone in her new apartment. She was supposed to be sharing the place with her fiance Joel - who, on the day of the move, announced he wouldn’t be joining her and instead would be staying at their old place with his new girlfriend. Soon after she is home for the holidays where she learns that her father has been having lapses. He’s in the early stages of Alzheimer’s and has already lost his position at the college teaching history. Ruth is asked to stay for 30 year old Ruth finds herself sitting alone in her new apartment. She was supposed to be sharing the place with her fiance Joel - who, on the day of the move, announced he wouldn’t be joining her and instead would be staying at their old place with his new girlfriend. Soon after she is home for the holidays where she learns that her father has been having lapses. He’s in the early stages of Alzheimer’s and has already lost his position at the college teaching history. Ruth is asked to stay for a year to help out. Her younger brother has decided to stay away, having still not forgiven their father for his infidelity and alcoholism when he was younger. Sounds like a ton of fun. But Rachel Khong works with a light touch. Ruth records her year at home in diary format. Her accounts are bookended with the notes her own father left for her in an old notebook. She reads about her youthful queries about where metal comes from and what flavor are germs. It’s a year in the life. There’s no real beginning or end, no tidy resolution. It barely hints at the inevitable struggle that will grow in the following years and already has the gauzy feel of nostalgia. It’s a book about memory and the things we hold on to. Goodbye, Vitamin tackles the topic of Alzheimer's and the impact it has on the people around you. Ruth recently turned 30 and dealing with her own grief after being broken up with by her Fiance. Decides to return home to live for a year, to help her Mother care for her Father whose going through the beginning stages of Alzheimer's, while also getting a better understanding of herself and her family. This novel although written well left me underwhelmed. I'm not quite sure if it was the fragmented writing style, the diary entry technique, or the quick jumps from past to present, and from topic to topic but I had trouble becoming emotionally invested in this novel. I felt disconnect and I thought the story format for me was too scattered and messy. One moment the author is sharing an anecdote from her childhood then she's thinking about her ex-fiance Joel and then suddenly a random fact about jellyfish. It was just so all over the map that I kept being pulled out the novel and I never got a chance to be fully emotionally invested. Unfortunately I have to check the "nope" column for this one. I just wasn't feeling the love so many Goodreaders seem to have for Goodbye, Vitamin. For starters, I wasn't a fan of the "this happened, and then this happened, and then this happened" writing style. I also had a strong feeling that the author had saved up every oddball thought she and her BFFs had had for the past five or six years and spent it all on her first novel—the quirkiness just felt extremely forced and some of the metaphor Unfortunately I have to check the "nope" column for this one. I just wasn't feeling the love so many Goodreaders seem to have for Goodbye, Vitamin. For starters, I wasn't a fan of the "this happened, and then this happened, and then this happened" writing style. I also had a strong feeling that the author had saved up every oddball thought she and her BFFs had had for the past five or six years and spent it all on her first novel—the quirkiness just felt extremely forced and some of the metaphors were eye-rollingly absurd. I know some readers have attributed the less-than-stellar writing to this allegedly being the main character's journal, but I'm not seeing any evidence that this is actually the case. Sure, the sections are labeled with the day of the year (until they aren't), but I think it was just a halfhearted attempt to impose a structure on a book that has no real structure to speak of—it's like a bunch of parts that have been laid out on a blanket, and no attempt has been made to fit them all together. I received an advance copy of this novel from the publisher via NetGalley, in exchange for an honest review. The honest truth is, I was not ready to read this. I was drawn to the story of a woman whose father is in early stages of Alzheimer's due to a similar personal situation. I read this less than three weeks after losing my father to a neurological condition that made him unable to speak and eventually progressed into dementia. I mention this because I expect that there's a link between my r I received an advance copy of this novel from the publisher via NetGalley, in exchange for an honest review. The honest truth is, I was not ready to read this. I was drawn to the story of a woman whose father is in early stages of Alzheimer's due to a similar personal situation. I read this less than three weeks after losing my father to a neurological condition that made him unable to speak and eventually progressed into dementia.